Download "ADMINISTRATOR, NETWORK AND INFORMATION SYSTEMS"
2 Administrator, Network and Information Systems - Continued Page 2 Plan, write and maintain documentation for data standards, procedures and definitions and application system procedures and guidelines. E Direct the design of application systems and databases requiring innovative and diversified approaches to the resolution of issues in the areas of data collection, data coding, system controls, connectivity, auditing, processing cycles and reporting. E Oversee the implementation of software and hardware updates; oversee the design and implementation of in-house requests for new system functionalities; assure minimal levels of production downtime. E Direct quality assurance and acceptance test plans for modified, enhanced and new forms, reports and database objects such as functions, procedures, packages, tables, views and indexes to assure application functionality and accuracy. E Oversee and review system specifications, bids and Requests for Proposals to assure technical requirements and standards are met; make presentations and provide recommendations to management regarding the purchase of new applications and databases. E Communicate with administrators, vendors, service providers, staff and other outside organizations to coordinate activities and programs, schedule work, resolve issues and exchange information; provide work direction to contractors; review completed work and work in progress for accuracy. E Prepare or direct the preparation and maintenance of a variety of records and files and prepare reports related to assigned activities; prepare data for a variety of reports. E Participate in the preparation of E-Rate proposals to obtain funding for projects; identify scope of proposed work; direct activities to complete scheduled work; approve invoices for payment. E Provide technical expertise and information to the Executive Director, Information and Technology Systems regarding assigned functions and participate in the formulation of policies, procedures and programs; advise the Executive Director of unusual trends or problems and recommend appropriate corrective action. E Develop and prepare preliminary budgets for assigned functions; analyze and review budgetary and financial data; authorize and control expenditures in accordance with established limitations. 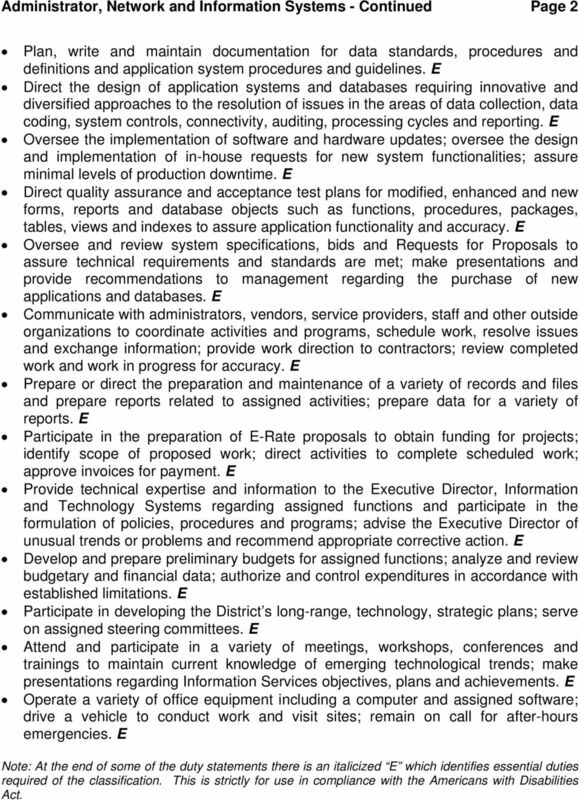 E Participate in developing the District s long-range, technology, strategic plans; serve on assigned steering committees. E Attend and participate in a variety of meetings, workshops, conferences and trainings to maintain current knowledge of emerging technological trends; make presentations regarding Information Services objectives, plans and achievements. E Operate a variety of office equipment including a computer and assigned software; drive a vehicle to conduct work and visit sites; remain on call for after-hours emergencies. E Note: At the end of some of the duty statements there is an italicized E which identifies essential duties required of the classification. This is strictly for use in compliance with the Americans with Disabilities Act. 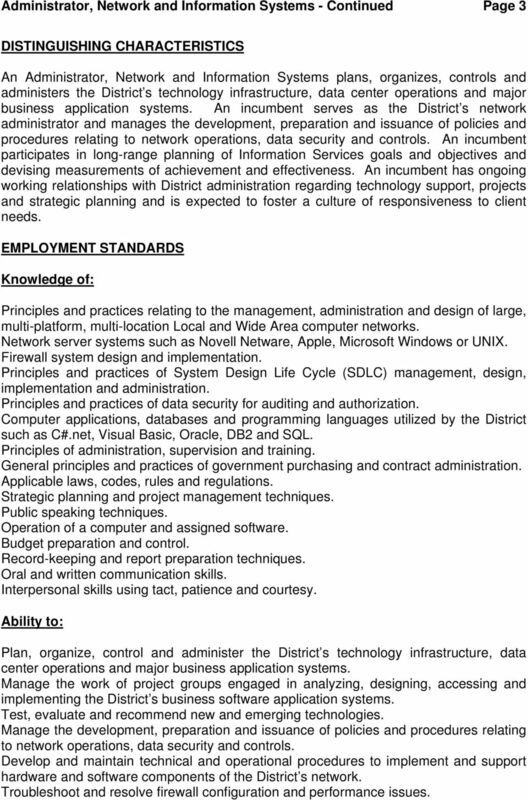 3 Administrator, Network and Information Systems - Continued Page 3 DISTINGUISHING CHARACTERISTICS An Administrator, Network and Information Systems plans, organizes, controls and administers the District s technology infrastructure, data center operations and major business application systems. An incumbent serves as the District s network administrator and manages the development, preparation and issuance of policies and procedures relating to network operations, data security and controls. An incumbent participates in long-range planning of Information Services goals and objectives and devising measurements of achievement and effectiveness. An incumbent has ongoing working relationships with District administration regarding technology support, projects and strategic planning and is expected to foster a culture of responsiveness to client needs. EMPLOYMENT STANDARDS Knowledge of: Principles and practices relating to the management, administration and design of large, multi-platform, multi-location Local and Wide Area computer networks. Network server systems such as Novell Netware, Apple, Microsoft Windows or UNIX. Firewall system design and implementation. Principles and practices of System Design Life Cycle (SDLC) management, design, implementation and administration. Principles and practices of data security for auditing and authorization. Computer applications, databases and programming languages utilized by the District such as C#.net, Visual Basic, Oracle, DB2 and SQL. Principles of administration, supervision and training. General principles and practices of government purchasing and contract administration. Applicable laws, codes, rules and regulations. Strategic planning and project management techniques. Public speaking techniques. Operation of a computer and assigned software. Budget preparation and control. Record-keeping and report preparation techniques. Oral and written communication skills. Interpersonal skills using tact, patience and courtesy. Ability to: Plan, organize, control and administer the District s technology infrastructure, data center operations and major business application systems. Manage the work of project groups engaged in analyzing, designing, accessing and implementing the District s business software application systems. Test, evaluate and recommend new and emerging technologies. Manage the development, preparation and issuance of policies and procedures relating to network operations, data security and controls. Develop and maintain technical and operational procedures to implement and support hardware and software components of the District s network. Troubleshoot and resolve firewall configuration and performance issues. 4 Administrator, Network and Information Systems - Continued Page 4 Supervise and evaluate the performance of assigned personnel. Assure compliance with applicable laws, codes, rules and regulations. Analyze situations accurately and adopt an effective course of action. Develop and prepare preliminary budgets. Monitor and control expenditures. Communicate effectively both orally and in writing. Establish and maintain cooperative and effective working relationships with others. Prepare and deliver oral presentations. Maintain confidentiality of sensitive and privileged information. Maintain current knowledge of technological advances in the field. Plan and organize work. Operate a computer and assigned software. Education and Training: Bachelor s degree in computer science, information technology, management information systems or a related field. Experience: Five years of supervisory or management experience involving network and application systems support in a large, multi-server, multi-location environment. Experience in an educational environment is preferred. Any other combination of training and experience that could likely provide the desired skills, knowledge or abilities may be considered. 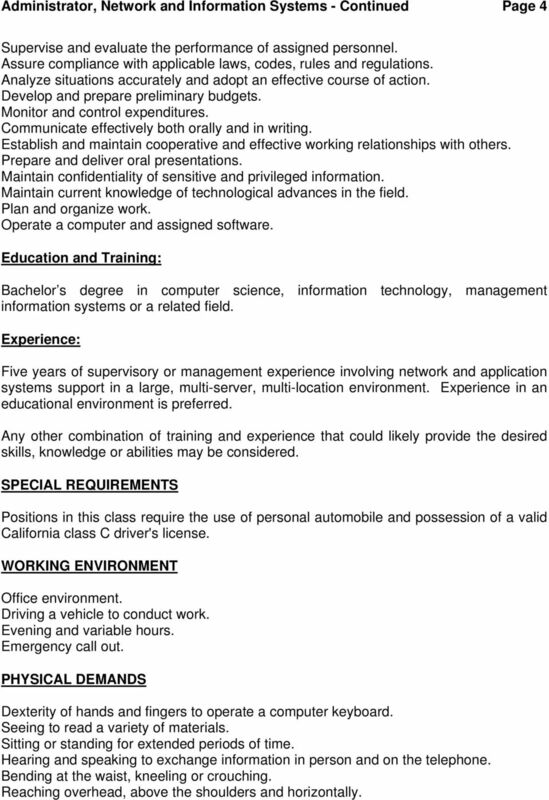 SPECIAL REQUIREMENTS Positions in this class require the use of personal automobile and possession of a valid California class C driver's license. WORKING ENVIRONMENT Office environment. Driving a vehicle to conduct work. Evening and variable hours. Emergency call out. PHYSICAL DEMANDS Dexterity of hands and fingers to operate a computer keyboard. Seeing to read a variety of materials. Sitting or standing for extended periods of time. Hearing and speaking to exchange information in person and on the telephone. Bending at the waist, kneeling or crouching. Reaching overhead, above the shoulders and horizontally.